SAN DIEGO, Apr. 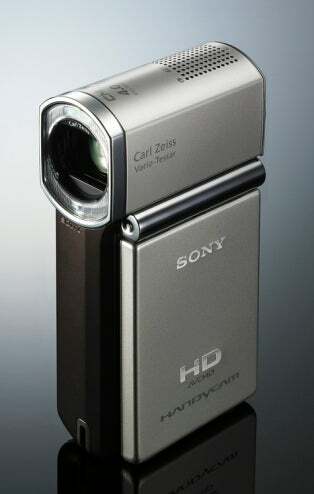 2, 2008 - The new pocket-sized Sony HDR-TG1 Handycam® camcorder's weighty high-definition capability will appeal to vacationers who prefer to "travel light." It is a full-featured camcorder that can record 1920 x 1080 HD video and 4-megapixel digital photos directly to Sony Memory Stick PRO Duo™ or PRO Duo Mark2 media cards. Its size and full recording capability makes it the world's smallest full HD camcorder. Another bonus for any traveler is the camcorder's durable titanium body and special hard coating that makes it highly resistant to scratches and quite fashionable. It ships with a supplied 4GB PRO Duo Mark2 media card so it's ready to go straight out of the box and you don't have to make space in your travel bag for extra discs or tapes. "Sony was the first to introduce a travel-sized camcorder with 8 mm technology in the 1980's, and it revolutionized the travel and electronics industries," said Kelly Davis, director of camcorder marketing at Sony Electronics. "This new model is a great example of our expertise in miniaturization, as well as advanced imaging technologies with features like face detection." This new model incorporates face detection technology for both video and still images, a technology also shared with select Sony Cyber-shot® digital cameras. It can identify up to eight faces in the camcorder's 2.7-inch touch panel LCD screen, and automatically adjust focus, exposure, color control for natural-looking skin tones, and when photos are taken, flash control. The camcorder features advanced video and audio technologies with simple, intuitive operation. It is equipped with a high-quality Carl Zeiss® Vario-Tessar® 10x optical zoom lens and 2-megapixel ClearVid™ CMOS sensor with Exmor™-derived technology, engineered to minimize picture noise. The camera's BIONZ™ processing engine also features noise reduction capabilities in addition to fast processing speeds. This engine powers the model's dynamic range optimization feature, which automatically adjusts under- or over-exposed areas in a picture. These technologies together produce high-resolution video and photos with natural color reproduction and rich details. Audio is recorded in Dolby® Digital 5.1-channel surround sound and features a built-in zoom microphone, delivering clear recordings of your subjects along with the video. Designed to be the perfect travel companion, the HDR-TG1 camcorder will ship with supplied accessories in May for about $900. There is also an optional travel kit (Sony ACC-TCH5) that includes a battery, travel charger and pouch for about $100. Plus, there is a custom-fit case (Sony LCM-TGA) for about $50. All can be purchased, along with other accessory options, direct at sonystyle.com, at Sony Style® retail stores (sonystyle.com/retail), at authorized dealers nationwide, and at military base exchanges. Pre-orders begin on Apr. 4 at www.sonystyle.com.